Over recent days the support for Gandhian Anna Hazare in his movement for a stronger Jan Lokpal Bill is growing in leaps and bounds. People are out in the streets holding peaceful demonstrations/rallies in all parts of India. They are coming out with their families, after their work hours despite of rains in some parts just to support a larger cause of the country. To be honest such kind of activity can not witnessed in India even during general elections. That is Anna effect. Even school going students are said to have derived inspiration from the movement and flock to rally venues. Every Indian town/village is witnessing a vehicular rally/candlelight march each day. The way the movement spread inspired me to take up a task of mapping these rallies. I have started off by mapping the places where rallies are being held on 20th Aug and 21st Aug 2011. I derived the information largely from social media like twitter, especially @janlokpal and India Against Corruption's facebook page. I admit that the map is somewhat incomplete as I was unable to map each and every location in India where demonstrations were/are being held. Therefore, my sincere request to readers is feel free to alert me(email: chethanuniversal[at]gmail[dot]com, twitter: @gischethans, or directly fill a form on the map) with the information on time and place of planned rallies. I will map them as soon as possible. 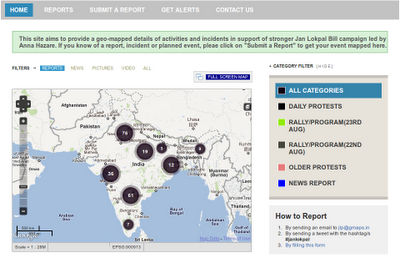 Update(21 Aug 2011, 18:48 IST): Today I enriched the crowdmap with videos and news from various sources. Before proceeding with my map, I had noticed the official India Against Corruption's map site designed with similar objectives where they encourage users to map their rally locations. This has led to people just entering their personal details instead of rally details. On the other hand my map allows users to submit details using a simple form which will be approved by me before mapping. Once again I appeal to the masses to submit photos, videos, news reports with location details using a simple form so that the ongoing movement can be mapped effectively.